North Hill Denture Clinic in Calgary, AB, cares for patients of all ages by protecting their smiles for a lifetime. Mouth guards for sports and night guards at bedtime are appropriate at any age to limit premature or accident-related tooth damage. Contact our office at (403) 282-6126 to make a family appointment when you or a loved one needs a little extra protection. A mouth guard is a necessary protective appliance for sports athletes of all ages. The use of a mouth guard protects your teeth from injury and prevents them from being knocked out by impact. 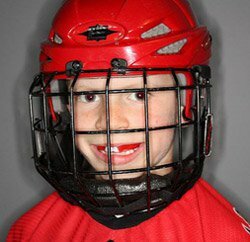 Mouth guards also protect your jaw and tongue from accidental misalignment or biting and will even minimize the severity of concussion in a head-on sports collision. Store-bought mouth guards are one-size-fits-all, which is rarely appropriate for both men and women or younger athletes playing school sports. A poor fit is less likely to offer full protection in an accident and may actually cause harm by obstructing normal breathing while exercising. At North Hill Denture Clinic, we can quickly make you an effective and customized mouth guard. Our team will take a detailed impression of your teeth and create a vacuum-formed Proguard mouth guard to fit snugly and safely over your upper and lower jaw. For the enthusiastic team player, we offer a rainbow of colors to coordinate with your gear, and we’re able to schedule appointments for an individual athlete or even a whole team of players. 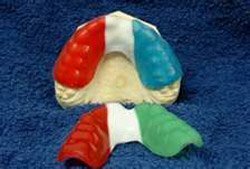 Contact us today for mouth guards that will both fit great and look great while protecting your smile. If you grind your teeth at night or suffer from chronic sleep apnea and/or snoring, a night guard is a simple solution that can have a significant positive impact on your sleep quality and overall health. Our custom night guards stop tongue thrusts, snoring, and alleviate sleep apnea. A better night of sleep and better health are possible when you contact us for an examination. Stress, anxiety, tension, misaligned teeth, posture, diet, and sleeping habits can all contribute to teeth grinding at night. Whatever the cause, we seek to help patients avoid the long-term side effects of grinding or clenching the jaw, such as TMJ (temporomandibular joint) dysfunction, uneven wear and tear on damaged teeth, tooth decay, chronic headaches, and muscle pain in the neck and shoulders. Our custom-fit night guards can protect your smile and enhance your health. At home, keep your mouth guard or night guard clean by rinsing it thoroughly with water and mild soap after every use and then allowing it to dry completely. Don’t use boiling water to disinfect the mouth guard, as the heat can cause the guard to warp and ruin the custom fit. Instead, ask the specialists at North Hill Denture Clinic in Calgary, AB, for specific cleaning advice if you think your mouth guard or night guard needs a deeper clean. Protecting your smile has never been so easy! Make an appointment today at (403) 282-6126.